Jakarta (15 September 2013) – With its much-anticipated Low-Cost Green Car (LCGC) policy finally in place a year after being announced, Indonesia has given great motivation to car manufacturers to produce cheap, eco-friendly cars. Most notable is the hefty discount, from 20% to 100% according to the degree of fuel-efficiency, on the 10% to 75% vehicle luxury tax. The Agya is priced from IDR99 million to IDR120 million (USD8700 to USD10 500) and the company targets monthly sales of 5000 units this year. 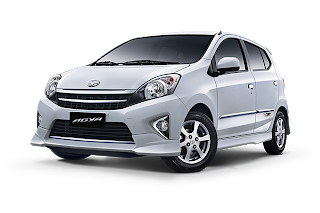 Astra Daihatsu Motor, a joint-venture firm between Daihatsu and Astra International in Indonesia, developed the Agya for Toyota. At the same time, Astra Daihatsu also released their own vehicle that abides by the LCGC specifications. The Ayla is priced even lower than the Agya, at a range of IDR76 million to IDR107 million (USD6700 to USD9400). “We hope Astra Daihatsu Ayla can contribute to the growth of car market and industry in Indonesia as expected by the government when they issued the LCGC regulation,” Sudirman MR, Astra Daihatsu Motor’s President Director, said. The company aims to sell 16 000 units by year-end. The third car manufacturer that jumped in for a piece of the pie is Honda, which revealed the Brio Satya last Wednesday. Toyota Agya: soon to flood the nation? However, not everyone is happy with the latest development in the Indonesian car industry. Some leaders are apprehensive that the policy would only exacerbate the already chronic traffic conditions in the cities. It is no secret that the Governor of Jakarta, Joko Widodo, is among those who are displeased with the new LCGC policy and has expressed his frustrations openly. His administration’s efforts to reduce dependency on privately owned vehicles will undoubtedly be somewhat thwarted. In contrast, the Deputy Governor, Basuki Tjahaja Purnama, has welcomed the policy and preferred to focus on public transportation improvements than to worry about the outcome of the new policy. Among the efforts to mitigate the inundation of cheap cars on the roads are the implementation of the ERP (electronic road pricing) for downtown entry, high-priced parking areas and plate-based regulations for limited access into certain roads during specific times. These are still in the planning stage while thousands of Agyas, Aylas and Brio Satyas are aready making their way onto the roads of Indonesia.